"The Son of the Althaus Family"
Charismatic While his world has dulled, his words had not. He is careful to hide his sadness, instead exerting his usual charm. An attractive man with great allures. He struggles to make others happy, not only so they can stop asking if he's fine but to try to ease their day. Savvy He knows his way around. Which path to take, which word to say. He learned too late, but now he knows. Pain has been a ruthless teacher. He's now perceptive, shrewd. He won't make another mistake. He won't allow himself to become hurt again because of his heart. Melancholy His mind refuses to forget. He yearns for his mind to be wiped clean, so he could forget her and everything that happened. So he could be rid of the sadness that plagues him. So he can no longer feel as if the entire world was sapped of its warmth. So he could feel something more than fear and coldness. Affable He has not forgotten how to have be kind. He retains his gentlemanly mannerisms, and all agree that he is a friendly soul. It's easy to talk to him, though he has lost his gregarious nature when he lost his Verloren. Flirty There's a hole, one that he dreams of filling. For a moment, he can allow the wool of illusion to fall over his eyes, to pretend and play. But then he remembers and his vivacious remarks are gone. Mischevious He tries to live each day, he tries to escape the pain of his past. He strives to change himself from that time, to change his personality and any reminders of those days. In that pursuit, he has learned to become a trickster. He attempts to remedy his life through comedy, even if the jokes are a little mean sometimes. Pompous Once an Althaus, always an Althaus. They had taught him the way of theatrics, the art of arrogance, and the attitude of self-importance. He fluffs himself up, preening his feathers and pretending to be something bigger than he actually is. Witty: His words are biting, playful, and intelligent. While Kallias isn't exactly a genius, his eyes are bright with knowledge that he is all too capable of using. While he was once a man of passion, he now follows his mind whilst wielding a silver tongue. Tea: A soothing, warm mixture of herbs and familiarity. Nothing else can ease Kallias' mind more than a cup of tea. Rain: The drumming of raindrops, sheltering the earth as the water washes everything away. Kallias can't help but watch the rain, allowing it to melt the world around him away. Reading: Books are the gateways to adventure and knowledge. They allow an escape from reality when nothing else can. Hydrangea: Beautiful flowers whose petals dance in the wind. Their calming colors that grow in meadows that reminds him of home. These flowers are easily Kallias' favorite. Fisticuffs: While Kallias isn't against a good spar, he does not like the sound of fighting hand to hand. It's brute, it's up close and personal, and it just doesn't seem pleasant. Black Birds/Ravens: Kallias never liked the birds since he was young, but now he more than detest them. Something about them seems disgustingly familiar, and their attitudes do nothing to help the situation. Coffee: Bitter, tasteless, familiar. He never liked coffee. She always did. Too many painful memories of sitting together, a cup of coffee in hand. Loneliness: It brings a feeling of cold. The shadows grow longer, it appears, he detests it. Others bring a warmth that he yearns for. That he needs. Kallias is a hopeless romantic at heart; ever since he was young he yearned for someone to love who would love him in return. His life was full of color when he thought he had achieved such a goal; when he had Verloren in his life. But she left and it shattered all of that, eliminating it. He fools himself into believing that he no longer needs love, but he silently wishes for that warmth to return. Magic. The power to change the world to the Magician's wishes. Power capable of amazing feats except for the one he really wants and beauty. As a Magician, Kallias wishes to grow himself, to become stronger and more knowledgeable. Ever since Verloren, Kallias had been scared of relationships, of commitment. He's terrified of his heart shattering further, of someone coming into his life and bringing happiness before breaking the illusion. He no longer wants the danger that commitment and relationships bring but he can't help dreaming. Ironic that for a man who's scared of commitment, he's terrified of loneliness. He doesn't want to be alone; to die alone. Yet on the flip side of the coin, he's afraid of being harmed again. He's stuck in place, yet Kallias sees no way he could escape the situation. Blond strands that shimmer in the sun like spun gold; a halo that frames his face. Beautiful, groomed, shining, all words that describe Kallias' hair. He keeps meticulous care of his locks, making sure that it always looks just right. His hair is always cut to his shoulders; he makes sure that each and every stand is that perfect shade of blonde to mask the black. Pale, white skin that is the envy of many, Kallias is a beautiful man. There is little wear or tear save for the faint, pink scars that mar his body. The only exception is his back - scarred and marred by the bolt of lightning. It's an arching web of aching lines that crawl outwards. Their winding fingers creep towards his neck, curl over his shoulders, and extend down his hips. Tall, svelte, lithe, willowy, these words are more than capable of describing Kallias. He's a tall man with a slim body that carries itself with nothing less than grace. Each movement is intentional and flowing, yet it lacks the life of a natural gait. It's instilled and almost robotic - it's the walk of a noble. Not only that, he keeps his weight in check. While his muscles aren't exactly defined, Kallias is far from fat. Windows to the soul, they reflect their owner's feelings and thoughts. Kallias' eyes; on days they are bright and seemingly carefree, the color of the sky on a clear day. Other times they're muddled, dark, like an angry ocean. Rarely do his eyes turn cold and cruel, like cracking clear ice. As a noble, Kallias wears stylish clothes on any day he's out of his dorm. His typical attire consists of a long-sleeved shirt with a cravat. The sleeves are puffy, the cuffs ending at his wrists. Over the shirt, Kallias wears a waistcoat-vest beneath a sky-blue justaucorps coat. Additionally, Kallias wears a pair of black culotte breeches paired with white socks and brown ankle boots. Usually, he'll wear his hair in a low-ponytail that's tied off with a red ribbon. 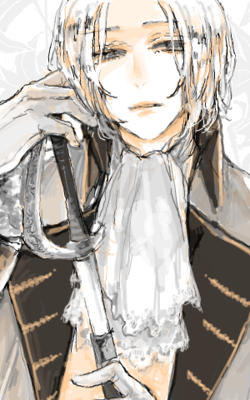 Due to his status as a student of Magnostadt Academy, Kallias often wears the black cloak over his regular clothes. On the white collar of the cloak is his 3rd Kodor badge, but the man wears other accessories. Such include an engraved silver ring, which is looped onto a golden wire as a necklace, and a pair of Aquamarine earrings. The necklace with the silver ring is tucked beneath the cravat. The final accessories that Kallias wears are his 3rd Kodor badge (worn on the breast pocket of his shirt), an engraved silver ring, an Aquamarine necklace, and a pair of matching earrings. The Aquamarine is polished and oval in shape, worn around the neck with a large golden wire. His earrings are tear-dropped shaped with a golden latch-back. Kallias's body language can be described as carefree and open. He is a man who does little to hide anything less than utterly important to him. He's an endearing person who likes to make little touches during a conversation (touching the elbow, shoulder, etc). He moves with grace and charm, his steps light and bouncy. Kallias is the owner of a pleasant voice. His words are coated in the accent of aristocrats, a leftover of his noble upbringing. However, his voice is more than that. It's fruitful; deep and strong in an appealing manner. His words echo with emotion, his tongue sharp with wit. The Althaus House is a family of Magicians who had flocked to Magnostadt during its founding years. Over time they had become a part of the noble ring within the nation-city, their family known for their quick-wit and mastery in Heat Magic. As their power grew within their circles, so did their influence. Throughout the years, the Althaus managed to keep their image somewhat clean, their business hidden from the public eye as they worked with the academy. As expectant, members of the house has grown up comfortable and privileged. They have access to the best teachers, to the best opportunities, and their lives, in the beginning, are relatively simple and easy. It's only when they enter the realm of politics do they truly begin to trouble themselves. Kallias is no exception; his parents are upstanding members of the community and valued within the family. He was loved and cherished if not a little bit neglected of attention from his working mother and fathers. There was an abundance of food and toys growing up, and a nurse by the name of Nadia took care of the boy. He had a happy childhood growing up, and Kallias has no qualms about it. His life only seemed to grow better the older he grew. 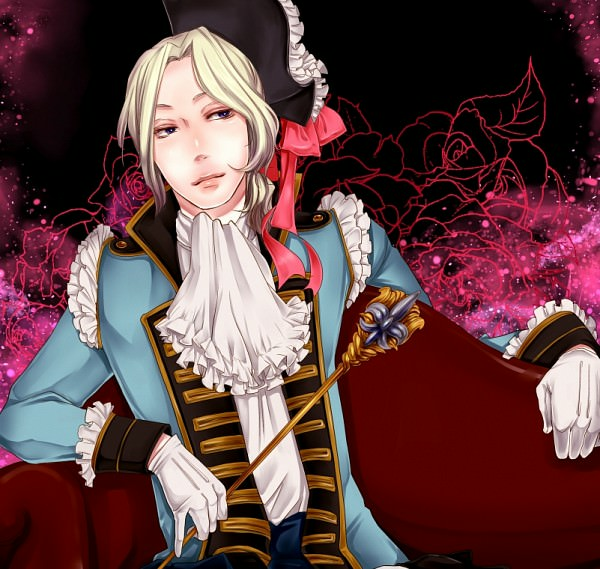 He excelled in the academic environment within the Magnostadt Academy, and he was rather talented with Heat Magic. He was popular with other students and he seemed to make friends easily. However, the most important person to Kallias within his adolescent was a girl by the name of Verloren. A simple girl from a simple family with a true talent for magic. She was a plain jane, but she still blew Kallias away. From day one, Kallias was infatuated. His entire being seemed to glow whenever she was around. His heart lit up, his day brightened, and he couldn't help but be happy when she gazed at him. He was captured by her wit, by her personality, and by her appearance. To others, she was a wallflower, but to him, she was a vibrant flower. Kallias knew that he would fall in love with Verloren and that she would fall in love with him. And for a while, it was true. They started to date towards the end of his sixteenth year Kallias was almost madly in love, staying close to Verloren through thick and thin. Even when his family rejected her for her simple background, he remained at her side. Even when others left her behind, Kallias continued to hold her hand. He saw beyond any flaws that others pointed out, and he truly fell in love during their time together. He was twenty-one and she was twenty when he proposed and she moved in with him. They bought a simple apartment in Magnostadt and for a while they were happy. But then something in Verloren changed. She became depressed and sick. Her moods changed rapidly, going from sad, to happy, to enraged. Her words were explosive, her blows stinging. At the drop of a hat, Verloren would attack him in a flurry of hands and magic, reprimanding him for the simplest of mistakes. However, Kallias endured, clinging to the naive hope that they could salvage their happiness. He ignored each slap, he forgave each outburst, and he never let go of her hand. But it was never enough, nothing he did was ever enough. Verloren only got worse and worse despite the help Kallias tried to give her. As time went on, the both of them continued to fray and break. Finally, it was Verloren who could no longer handle it. After one night, a night that would burn itself into Kallias memory. His mind would never forget the flash from behind him, the sound of static and a scream filling the air, the scent of burnt flesh, and the sensation that coursed through his body. The feeling of clothing melting with skin followed by the shriek of terror and remorse, and finally the gentle coldness of a purple glow. In a moment after another argument - brought up because Kallias had given her the wrong book of all things - Verloren lost it. In a scream of bloodlust, she attacked her Fiancé, leaving a life-long wound. Despite the fact that she had did her best to heal him, despite the fact that Kallias himself had forgiven her, begging her to forgive herself, Verloren would not. With a steady hand, she took her life the following night. The action left Kallias alone and broken, dealing more harm than anything else the woman had done to him in the past. With that one blow, Kallias found himself surrounded by darkness and coldness. A switch flipped, reverting color to monochrome, turning music to monotone, and leaving him with no warmth. It took him years to recover from his state of depression that Verloren, and in that time he had shrunk, creating a wall between himself and others so he could protect what was left of his heart and mind. Kallias stumbled on his feet, his hand flying out to catch himself. His fingers scraped the wall, stinging pain coursing up his arm as the Magician regained himself. Leaning against the stone, his breaths came in gasps as his chest fluttered. All he could hear was the rushing of his blood, and when he swallowed, Kallias could feel his heart thumping in his throat. The name crackled in the air, garbled and distorted. Verloren, Verloren, her voice never left his head. But now, it was twisted, shaped by something cruel and cold. It echoed with pain and malice. Pushing himself away, Kallias continued to run. His feet pounded against the path, his vision tunneled. With a sharp turn, he barreled down an isolated alley, the voice's laughter in hot pursuit. The noise urged him, driving him to ignore the heat that licked his sides. Then he crashed into another, his vision going white as Kallias felt himself dropping. He hit the ground, the remaining wind in his lungs disappearing from the blow. Pain webbed from his back, pulsing from beneath the skin as he shook his head. "A-Ah... I'm sorry, sir..." Kallias panted, weary blue eyes flickering open. His gaze drifted up before the Magician froze. His mouth fell open, his body starting to tremble once more as a creature bent over him. Black feathers floated down around them, almost drawing his attention away from the cruel mask of a smile on his face. Tormented blue eyes glittered, his face framed by feathered black hair. Light flashed off a turquoise earring as a clawed hand reached down to grab Kallias. He hit the wooden floors with a thud as Kallias stifled a scream. His limbs writhed against the white covers he was wrapped in, his body flipped upside down. With a kick, he freed himself from their bindings. He clawed away from his bed, his legs hitting the ground as Kallias struggled to escape his nightmare. His eyes couldn't help but feverishly search the shadows that stretched around the room, checking to make sure that the creature hadn't escaped his mind. Once he was certain he was safe, Kallias' body sank into the floor. His fingers clawed through his golden locks before he rested his forehead on his fists. Requirements/Drawbacks: The user must gather Magoi at the tip of their catalyst and then have the catalyst swung to aim at the chosen target. Scaling: Hits; for every 10 Magoi invested, the user creates an additional ball of fire. Kallias gathers magoi at the tip of his catalyst for a moment, ordering the Rukh to ignite the gases (mainly oxygen) around the catalyst. The air combusts into a ball of fire with a diameter of 1m; due to the oxygen-rich fuel used for the spell, the fire burns bright blue. Once the ball forms, Kallias either swing the catalyst or has it swung at his target, shooting it forwards. It’s capable of traveling up to 8m away and deals D-tier damage to whatever it makes contact with. [b]Requirements/Drawbacks:[/b] The user must gather Magoi at the tip of their catalyst and then have the catalyst swung to aim at the chosen target. [b]Scaling:[/b] Hits; for every 10 Magoi invested, the user creates an additional ball of fire. Requirements/Drawbacks: The user must swing their catalyst diagonally in their chosen direction, saying the name of the spell as they do so. Scaling: AoE; for every 10 Magoi added, the diameter of the area is increased by 2m. Kallias swings his catalyst diagonally, from top to bottom whilst saying “Tanmu Alghulyan”. With this, he’s ordering the Rukh to heat up a circular patch of area in front of him. The diameter of the patch is 3m, and the center of the spell may be placed up to 5m away from Kallias.The air in the patch shimmers with heat, distorting the air slightly; this is the only sign of the affected area. The heated area will disappear after 1 post unless scaled. Any liquids will evaporate, solids (such as ice, plastic, and other items with low heat resistance) will melt, and atoms within gases will ionize to the point of combustion. Living organisms that pass through the area (including the user, unless his Borg is active) will suffer from a minor heat stroke for 1 post. [b]Requirements/Drawbacks:[/b] The user must swing their catalyst diagonally in their chosen direction, saying the name of the spell as they do so. [b]Scaling:[/b] AoE; for every 10 Magoi added, the diameter of the area is increased by 2m. [*]Any liquids will evaporate, solids (such as ice, plastic, and other items with low heat resistance) will melt, and atoms within gases will ionize to the point of combustion. [*]Living organisms that pass through the area (including the user, unless his Borg is active) will suffer from a minor heat stroke for 1 post. Requirements/Drawbacks: The user must wave their wand in a downward strike in their chosen direction whilst saying the name of the spell. Kallias swings his catalyst in a downward strike whislst saying "Alainfijar Albarid". This is a command to the Rukh to drastically lower the temperature of a circular patch of area. The diameter of the area is 3m, and the center of the spell may be placed up to 5m away from Kallias. The cooled area will disappear after 1 post unless scaled. The spell freezes gases in the air to the point they condense, liquids are frozen, and the surfaces of solids are covered in a level of frost. Living organisms within the area (including the caster, unless their borg is active) will experience a mild case of hypothermia for 1 post. [b]Requirements/Drawbacks:[/b] The user must wave their wand in a downward strike in their chosen direction whilst saying the name of the spell. [*]The spell freezes gases in the air to the point they condense, liquids are frozen, and the surfaces of solids are covered in a level of frost. [*]Living organisms within the area (including the caster, unless their borg is active) will experience a mild case of hypothermia for 1 post. Requirements/Drawbacks: The user must raise have their catalyst raised, pointing the tip at their chosen direction. They then must call the name of the spell. Kallias either raises his catalyst or has his catalyst raised, pointing the tip of it in a chosen direction before saying, “Tawat Alainfijar”. This orders the rukh to gather at the tip of the catalyst, combusting gasses in the air. The fire is then shot forwards in a flamethrower fashion; it can reach up to 10m away, and its width is 30 cm. Those caught in the flames are dealt D-tier damage unless scaled. Due to the oxygen-rich source of gasses used for the spell, the fire is bright blue in color. [b]Requirements/Drawbacks:[/b] The user must raise have their catalyst raised, pointing the tip at their chosen direction. They then must call the name of the spell. Requirements/Drawbacks: The user must wave the tip of their catalyst in a circular motion before pointing towards their chosen target. Kallias waves the tip of his catalyst in a circular motion, gathering magoi whilst he does so. He then points it towards a target, ordering the rukh to chase it; however, the farthest the Rukh can travel is up to 3m away. It then encircles the target, combusting the gasses around it. This results in an explosion that's 4m in diameter, engulfing the target and dealing C-tier damage. Due to the oxygen-rich source of gasses used for the spell, the fire is bright blue in color. [b]Requirements/Drawbacks:[/b] The user must wave the tip of their catalyst in a circular motion before pointing towards their chosen target. [b]Appearance:[/b] A 50 cm long, 15 cm wide wand. The design is that of a solitary, blue orb that looks like it's distorting gravitational waves in the shape of a spiral. [*][b]Planet Juggling -[/b]The user feeds magoi into the wand and says "orbit". The ground around the user then starts shifting and warping, eventually shaping into 4 spheres that vary in size between .5 meters and 1 meter. The spheres then orbit around the user at a leisurely pace. If the user decisively points the wand at a target, one or more of the spheres will fling itself towards that target up to 20 meters away. The number of spheres flung depends on the user's will. Each sphere is capable of dealing C-tier damage upon impact, even when orbiting the user. 10 magoi to activate | 5 Magoi to sustain. [b]Appearance:[/b] Harq is a 1.3m (4.5 ft) staff made of black steel and fashioned into a spear. There’s red fabric wrapped around the handle of the spear with a matching piece of fabric wrapped near the guard to the blade. The blade itself is 30cm long, flat, and ends in a dull point. i. the image should be 430 x 470 - in case you ever want to change it, the current image url is 'ttps://i.imgur.com/N5tMs52.png'. iii. since i felt like regular bolded text wasn't bright enough, i increased the color brightness for any text within . using will cancel the effect for some reason. vi. whether you use or it will always turn up purple. v. notes can go on and on. Ariel Harel - What an annoying, irritating, indecent, handsome brat. He curses, he's so rude, and he just gets on my nerves. Who does he think he is? Something about his tone just makes me mad, and that's a shame. If we had met under better circumstances and if he wasn't so... Ariel, then I wouldn't mind talking with him more. But as he is, I just want to launch him into the sun.